Teaser of Mammootty starrer ‘Uncle’ shows an unusual pair !! Mammootty and Prithviraj go to Bhavana and Naveen’s wedding gathering. See photographs ! 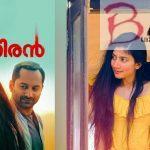 Jewel MaryTo Team Up With Jayasurya For His Next Njan Marykutty !! Mammootty’s Street Lights: The First Teaser Is Out! Mammootty’s next Movie, titled “Unda” Gets Trolled !!!!! Mammootty’s ‘Peranbu’ to debut at International Film Fest Rotterdam?! !